One of the many features of WebChat is called Multiple WebChat pages. 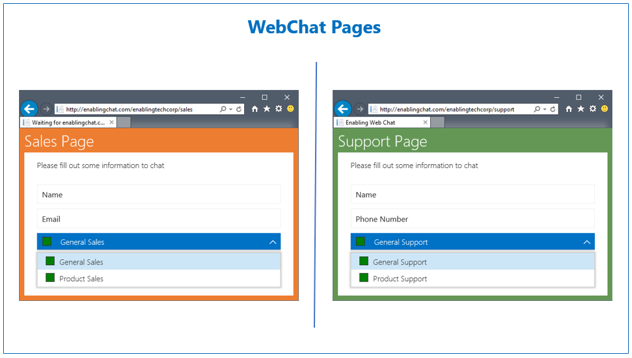 This feature allows you to create different versions of the WebChat client and have them placed on the different sections of your website. You can create a WebChat page and embed it onto a Sales section of your website that displays only a Sales group or groups. Likewise, you can also create a separate support page and place that on the support section of your site. Each page can have its own set of Questions, Groups and Users assigned to those groups. 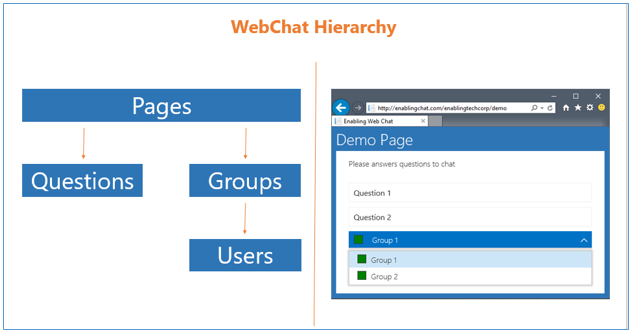 The left diagram shows that WebChat is built using pages. Each page can have its own set of Questions, Groups, and Users assigned to it. The image on the right shows that I have a “Demo” page with a set of questions and groups. The left image is a ‘Sales’ page and the right image is a ‘Support’ page. Each page has its own unique URL to embed onto a specific section of your website. You can customize each page to have its own look and feel, set of questions, set of groups, and users assigned to them. This feature will allow more flexibility when embedding a chat window onto your website. This feature also allows separation between your groups. If you have a support page, it may not be necessary to display a Sales group in that chat window as well. If you are interested in creating an infinite number of WebChat pages to place onto your website. There are also many different places that you could embed a chat window.